Today is Decision Day in the presidential election. Now what? Are you one of the hundreds of millions who will go back to business as usual? Then you’re part of the problem. At some point in the general election, many people have not felt proud of the choices we had for president. They consider that the deed is done now, and the work is over. Our propensity to turn our back on all things politics is what brought us to the chaos we have today. Because we take so much for granted, we assume that things will always magically work themselves out. We assume that past victories will never have to be re-litigated again, because we have evolved. Meanwhile, people who are disaffected are hungering for anything that looks like change. They can no longer tolerate the status quo. They take sustained action, and they motivate themselves. Consider one aspect of American politics. 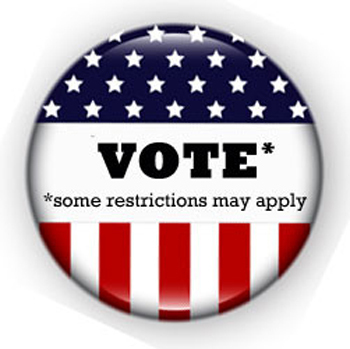 Voter suppression has always been part and parcel of it, since the conception of this country. The founders did not consider “everyone” worthy of being able to cast a vote. White, male, educated, landowner were the pre-requisites. No matter how smart you were as a woman, or even a working-class white man, if you didn’t have property, your participation was not welcome. Yet today, we could make history with the next, female, president, as we have made history with the current president. It should not surprise you that even as the electorate expands, there remain some people who wish to restrict how that franchise is used. You may have a personal distaste of politics, find your time too precious, or come up with any other number of excuses. That may or may not be a valid decision at this time of your life. But it doesn’t absolve of performing your civic duty. No doubt you know some young people. Why not interest them in interning with some elected officials? How about taking a job as a poll worker? One county government pays a stipend of $200 for your decision to spend the day serving your local fellow citizens. You can attend a party, go to a fundraiser, write a check, make a few phone calls, or simply encourage a few relatives to make time to vote. You can attend a local zoning board meeting once a year. The options abound. When people of goodwill don’t do the hard work of democracy between presidential election cycles, it leaves a vacuum, P-grabbers (I mean power-grabbers, not the other kind), and sycophants rush in to pollute the system even further. As lay people, we don’t have to be steeped in politics to make a difference. Next time you get an invitation to attend a political event, go! It matters not which party is hosting it. Inform yourself. Go hear what makes other people tick. By doing something as basic as showing up to observe your local political process, you will have done something constructive, in a cumulative sense. By showing up, you become familiar with the issues. Your elected officials will notice. They will remember that their job is to represent people like you. Steady streams of lobbyists court the favor of elected officials day after day. They email, they text, they call, and they show up to petition for what they want. Often, your tax dollars finance their wish list. Shouldn’t you have a say? Sadly, you will not find media outlets breathlessly reminding you of these opportunities for you to make a real impact. Get involved; you bear responsibility for that decision. Exercise it every chance you get.